In the restaurant, we used to make Salmon Coulibiac for New Years appetizer. It was wildly popular and considering how easy it is to make and the big WOW factor, I am surprised we didn’t offer it more than just on New Years menus. 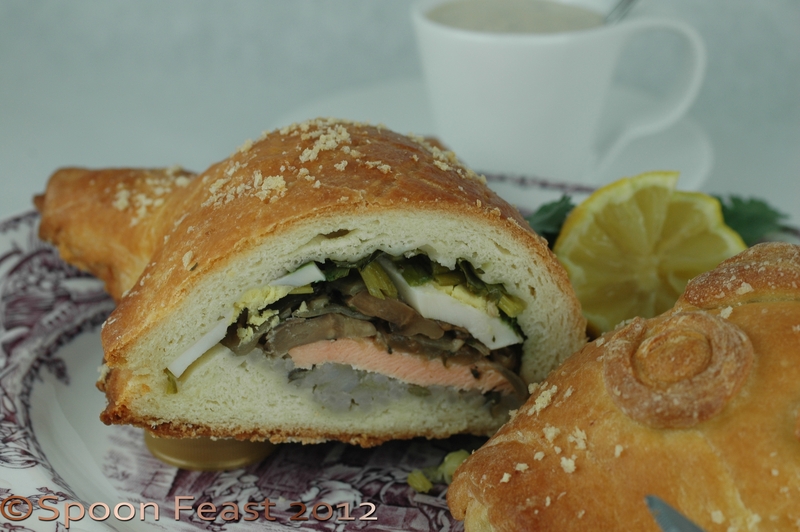 Salmon Coulibiac is a great dish to use poached salmon but this time, I had some salmon left over from dinner. So I decided to use that up. This recipe makes quite a bit. I got 2 lovely fish out of it and still had enough left over to make a couple of smaller rolls with the filling. There are a couple of ways to approach this, you can layer the filling ingredients or you can mix them all together. Personally, I like layering as the sliced serving looks so much better. Saute the onions and mushrooms in butter until done. Season with salt and pepper, deglaze the pan with a splash of white wine. Lay the puff pastry on a cutting board. Trace and cut into a large fish shape. Cut two: one for the bottom and the other to top. The top should be slightly larger than the bottom. Transfer the bottom fish shape to a sheet pan lined with parchment and dusted lightly with corn meal. Leaving a 1/2 inch border around the outside, place a bottom layer of cooked rice. Top with cooked salmon, then the onions and mushrooms, hard-boiled eggs, cilantro and scallions. Moisten the edge of the dough with egg wash, top with the other piece of dough. Press together to seal the edges all around. 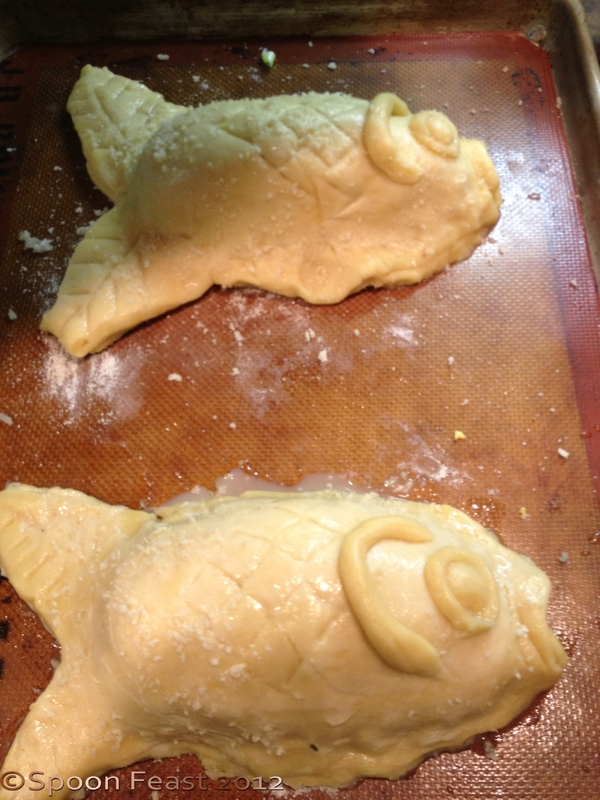 Using scraps of dough, decorate the surface to create gills, eye, scales can be traced with a knife point. Cut through the dough in a few places to create vents for steam to release during cooking. If you don’t, your fish will break open during baking. Not a good look. Use egg wash to hold the decorations in place and wash the entire surface with egg wash to give a nice shiny surface to the finished dish. Sprinkle a few bread crumbs on the surface if you like. Bake is a 375°F oven for 40 minutes or until done and golden brown. Bring the half and half and cream to a boil, whisk in the mustard and garlic, simmer for 5 minutes. Adjust seasonings with salt if needed. Slice the Salmon Coulibiac and place each slice on a plate, put a spoon of sauce over one edge. This is a great dish to use up any leftover salmon and rice you may have in the fridge. 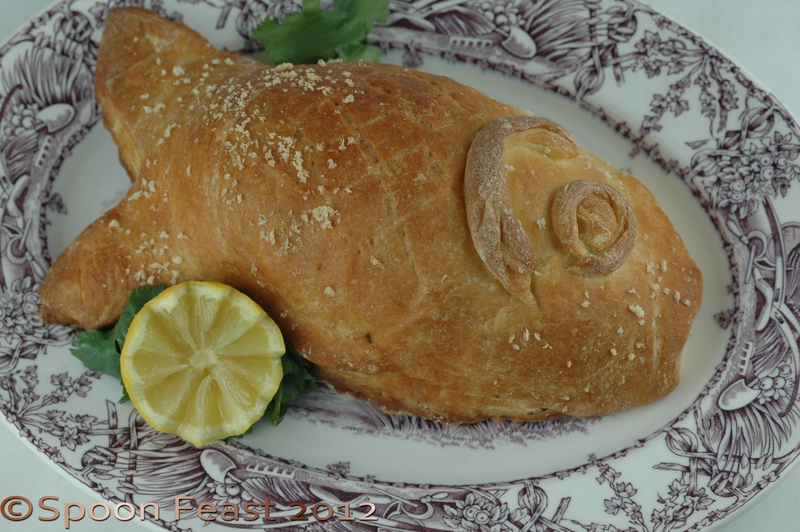 If you aren’t the whimsical type and want to make this without the fish shape, you can. Personally I love the fish shape, it makes me smile! This entry was posted in Cooking, Recipes and tagged baked salmon, Boiled egg, cooked salmon, Mustard, Puff pastry, Rice, Salmon, salmon coulibiac. Bookmark the permalink. What a pretty dish…it sounds wonderful.